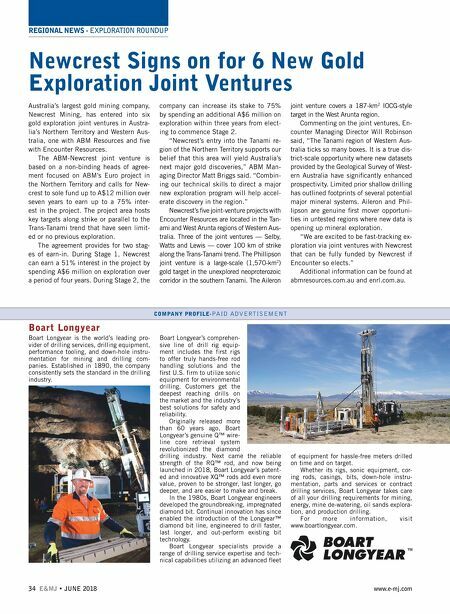 REGIONAL NEWS - EXPLORATION ROUNDUP 34 E&MJ • JUNE 2018 www.e-mj.com Newcrest Signs on for 6 New Gold Exploration Joint Ventures Australia's largest gold mining company, Newcrest Mining, has entered into six gold exploration joint ventures in Austra- lia's Northern Territory and Western Aus- tralia, one with ABM Resources and five with Encounter Resources. The ABM-Newcrest joint venture is based on a non-binding heads of agree- ment focused on ABM's Euro project in the Northern Territory and calls for New- crest to sole fund up to A$12 million over seven years to earn up to a 75% inter- est in the project. The project area hosts key targets along strike or parallel to the Trans-Tanami trend that have seen limit- ed or no previous exploration. The agreement provides for two stag- es of earn-in. During Stage 1, Newcrest can earn a 51% interest in the project by spending A$6 million on exploration over a period of four years. During Stage 2, the company can increase its stake to 75% by spending an additional A$6 million on exploration within three years from elect- ing to commence Stage 2. "Newcrest's entry into the Tanami re- gion of the Northern Territory supports our belief that this area will yield Australia's next major gold discoveries," ABM Man- aging Director Matt Briggs said. "Combin- ing our technical skills to direct a major new exploration program will help accel- erate discovery in the region." Newcrest's five joint-venture projects with Encounter Resources are located in the Tan - ami and West Arunta regions of Western Aus- tralia. Three of the joint ventures — Selby, Watts and Lewis — cover 100 km of strike along the Trans-Tanami trend. The Phillipson joint venture is a large-scale (1,570-km 2 ) gold target in the unexplored neoproterozoic corridor in the southern Tanami. The Aileron joint venture covers a 187-km 2 IOCG-style target in the West Arunta region. Commenting on the joint ventures, En- counter Managing Director Will Robinson said, "The Tanami region of Western Aus- tralia ticks so many boxes. It is a true dis- trict-scale opportunity where new datasets provided by the Geological Survey of West- ern Australia have significantly enhanced prospectivity. Limited prior shallow drilling has outlined footprints of several potential major mineral systems. Aileron and Phil- lipson are genuine first mover opportuni- ties in untested regions where new data is opening up mineral exploration. "We are excited to be fast-tracking ex- ploration via joint ventures with Newcrest that can be fully funded by Newcrest if Encounter so elects." Additional information can be found at abmresources.com.au and enrl.com.au. 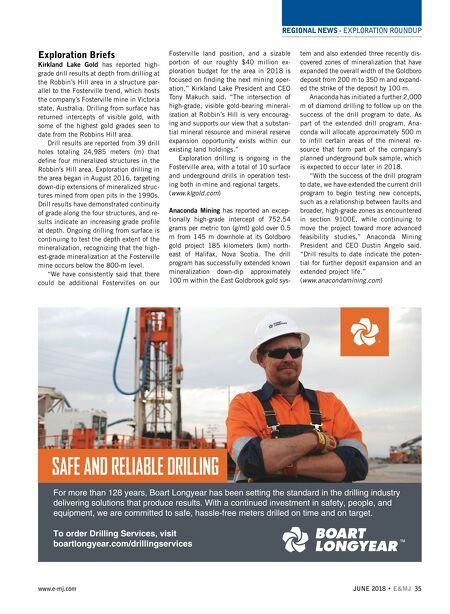 COMPANY PROFILE-PAID ADVERTISEMENT Boart Longyear Boart Longyear is the world's leading pro- vider of drilling services, drilling equipment, performance tooling, and down-hole instru- mentation for mining and drilling com- panies. Established in 1890, the company consistently sets the standard in the drilling industry. Boart Longyear's comprehen - sive line of drill rig equip- ment includes the first rigs to offer truly hands-free rod handling solutions and the first U.S. firm to utilize sonic equipment for environmental drilling. Customers get the deepest reaching drills on the market and the industry's best solutions for safety and reliability. Originally released more than 60 years ago, Boart Longyear's genuine Q™ wire- line core retrieval system revolutionized the diamond drilling industry. Next came the reliable strength of the RQ™ rod, and now being launched in 2018, Boart Longyear's patent- ed and innovative XQ™ rods add even more value, proven to be stronger, last longer, go deeper, and are easier to make and break. In the 1980s, Boart Longyear engineers developed the groundbreaking, impregnated diamond bit. Continual innovation has since enabled the introduction of the Longyear™ diamond bit line, engineered to drill faster, last longer, and out-perform existing bit technology. Boart Longyear specialists provide a range of drilling service expertise and tech- nical capabilities utilizing an advanced fleet of equipment for hassle-free meters drilled on time and on target. Whether its rigs, sonic equipment, cor- ing rods, casings, bits, down-hole instru- mentation, parts and services or contract drilling services, Boart Longyear takes care of all your drilling requirements for mining, energy, mine de-watering, oil sands explora- tion, and production drilling. For more information, visit www.boartlongyear.com.